Every year (well, most years), I have a New Year's Day brunch for my friends. New Year's Eve itself is almost always a letdown. It's cold, there's too much pressure to be having the BEST TIME EVER, and wearing something fancy is almost always a bad decision by the end of the night, when you have to stand outside in a short skirt and heels trying to get a cab. My New Year's Eve this year was a bottle of sparkling wine on the couch while we watched SVU, and there was nowhere I would have rather been. New Year's Day, though, is a different story. Nobody wants to cook for themselves, and no one is quite ready to go back to work. People are happy to just hang out, drink bloody marys, and play card games. It might be my favorite holiday. The key to making sure that it's also fun for me is picking dishes that I can do the majority of the work for ahead of time. That way, I can just throw everything in the oven in the morning, and by the time everyone arrives, I'm already sitting on the couch with a drink. One of the things I made this year was Bavarian soft pretzels. It was a good decision. There are a lot of steps, and rolling them out takes a bit of practice, but they're actually pretty easy. Most of the time, you're just waiting for them to rise. There are a few points along the way when you might think that you're doing it wrong. Don't worry, just power through. Yes, that small ball of dough really will roll out to 18 inches, and your pretzels really will puff up and brown, even though they're pale and slimy now. And when they do, you're going to be so glad that you went through it all. These pretzels are warm and golden. The gluten develops into long, tender strands that give the perfect texture: not crumbly, but dense and yet light. There's a crispy (but not crunchy) crust on the outside, and the flakes of salt on top give it just enough pop. We served ours with some real Dijon mustard that my brother brought back from France, but they'd also be great on their own, or with beer cheese, or honey mustard sauce, or aioli, or... You'll figure it out. In a large bowl, mix flour and butter. Use your fingers or a pastry cutter to cut the butter into the flour until evenly distributed. Add water and mix until absorbed. Add the salt to one side of the dough and yeast to the other side and work in both. Place the dough on a lightly floured counter top and form into a rectangle. Cut into 16 equal pieces. Form each piece into a ball, and allow to rest covered for about 5 minutes. Roll out each piece with your hands until it is about 18 inches long, tapering the ends slightly. To form the pretzels, grab hold of each end and cross the left end over the right with the looped portion nearest you. Now create a twist by crossing top piece under. Finally, lift the twisted ends and flip them over onto the loop. Press the ends down to seal. Place the pretzels on a oiled baking sheet, cover with plastic wrap, and refrigerate for 2-24 hours. When you are ready to make the pretzels, preheat the oven to 350 degrees and bring 4 quarts of water to a boil. Add the baking soda slowly and turn the heat down to a simmer. Place the pretzels into the boiling water one at a time, simmering on each side for 15 to 20 seconds. Remove from the water, drain well, and return to the oiled baking sheet. Repeat for the rest of the pretzels. 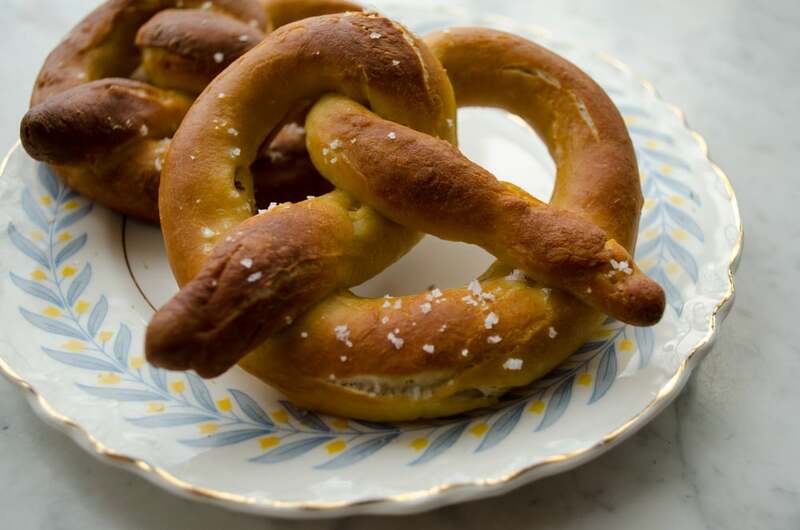 Sprinkle pretzels with kosher salt and/or sesame seeds and bake until they are a rich brown, about 35 minutes. Enjoy warm or at room temperature with a good mustard. They are best fresh, but can be stored, well sealed for a couple of days.